You will find that you can't always buy the part from the supplier offering the lowest price, because of minimum order requirements, so I'll list several suppliers where applicable. Prices given are for each piece unless otherwise indicated. Props to Larry Hendry, who compiled some of these and saved me a bunch of work. If you have ideas for common and useful MOTM parts that should be listed here, contact me! Note: in keeping with the MOTM standards for parts quality, only the "good stuff" is listed here. If you want to substitute cheap jacks and pots, do your own research! Switchcraft #112A - accept no substitutes! Lockwashers for 112A - the finishing washer is always supplied, but the lockwasher isn't. Good sealed pots are expensive and are hard to find retail. Synth Tech's pots are generally custom ordered by Paul in large quantities, and he has to wait months to get them. If you just need one or two, you might try emailing Paul directly and see if he'll sell you a couple. The ones listed below exist as of this writing (Jan. 2001), but may not be available forever. Exact replacements are made by NKK, but others will match visually if you get bat handles with a bright finish. You can see a picture of it on the DarkStar panel mounting page. Mountain Switch sealed 12 position 1 pole rotary switch (adjustable stop) - used for Larry Hendry's JLH-831 and JLH-822 control voltage switching modules. Need a 1U tall standard 19" blank rack panel for your MOTM rack? Or maybe a 5U tall one to cut up because you are making something wider than the 3U blanks you can get from Synthesis Technologies? Here are some that have a textured black finish that looks pretty darn close to the MOTM panel finish. Allied #724-1908, latest catalog claims they don't sell it over the internet which is bullcrap, because I bought one a few months ago! Texas Instruments LT1013CP - dual precision low drift DC opamp, use for building control voltage mixers and buffers, etc. Analog Devices OP275GP - dual precision low noise opamp, use for building audio mixers, etc. 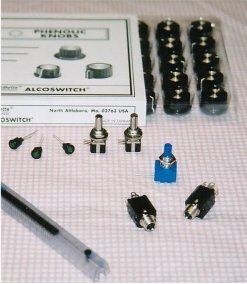 Xicon aluminum electrolytic, radial leads, 10uF, 50V - use as the primary power supply filter caps at the input power connector. AVX #SA105E104MAA ceramic, axial leads, 0.1uF - use for secondary power supply filters between each IC's power input pins and ground. AVX yellow box multi-layer film .001uF (1n0) - use for general purpose timing and decoupling caps, other values are available.